As a school girl, when I was old enough to protest to my mother on how boring my daily lunch box of white bread sandwich was, she gave up on me and gave me money instead. So I had 5 ringgit to spend on during recess and after school at the canteen every day. I was lucky to have studied in schools with respectable canteen operators who provided not only a good variety of Chinese, Malay and Indian choices but rather excellent in quality too. Some afternoons I would be spending a dollar or two at the kuih stall, getting almost the same items every time - curry puffs (savory) and two slices of seri muka (sweet). On some days, the kuih makcik (makcik means auntie in Malay) would have pulut udang and those were the days I'd ditch the curry puffs. Seri muka literally means beautiful face in Malay. 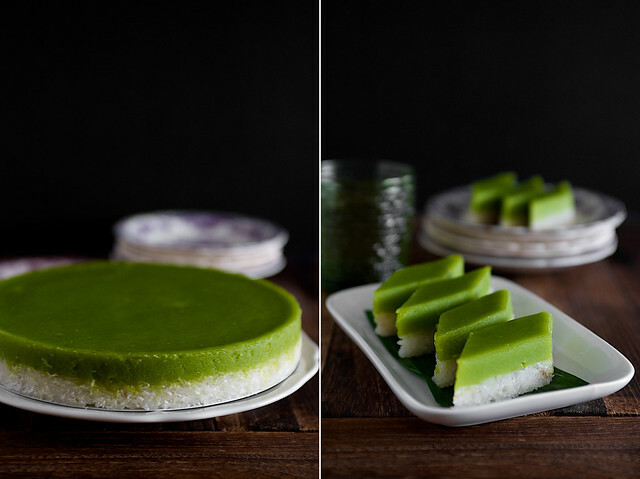 A two-layered steamed concoction of glutinous rice on the bottom and silky smooth pandan custard on top, it's heady with the flavor of coconut milk and remains my all-time favorite sweet kuih. After moving to Singapore, where authentic Malay kuih stalls are not as common, and I haven't have a decent piece of seri muka for years, until my brief stint at a previous job that had a Malay staff cafe operated by a family from Malacca (!!!). Fellow Malaysians would understand my necessity to use (three) exclamation marks at the mention of that small, historical Straits Settlement state. This place produces the best cooks, kuih makers and its distinct Baba Nyonya culture. After my daily tea time visits to the cafe's afternoon kuih spread, I managed to beg ask the family's matriarch, Makcik Enon, for her seri muka recipe. I believe she obliged because I never failed to buy two pieces from her every day she sold it. Her recipe requires a bit more work but let's get one thing straight here about kuih and anything makciks make - steamed cakes, butter cakes, chiffon cakes, Swiss rolls et cetera. While looking simple, unadorned, unassuming and sometimes right out plain, they're never easy to master. Home cooks who've attempted to recreate quality chiffon cakes and curry puffs would know what I'm talking about. Not that I've braved curry puffs, this other green fluff, yes, but not curry puffs. Luckily for me, my first try on this other green thing turned out to be quite acceptable. More liquid for cooking the rice in my cooker next time but other than that, I was quite relieved to open my wok cover to reveal something smooth, handsomely dark green and close to Makcik Enon's perfect version. Close, not there yet, but almost. 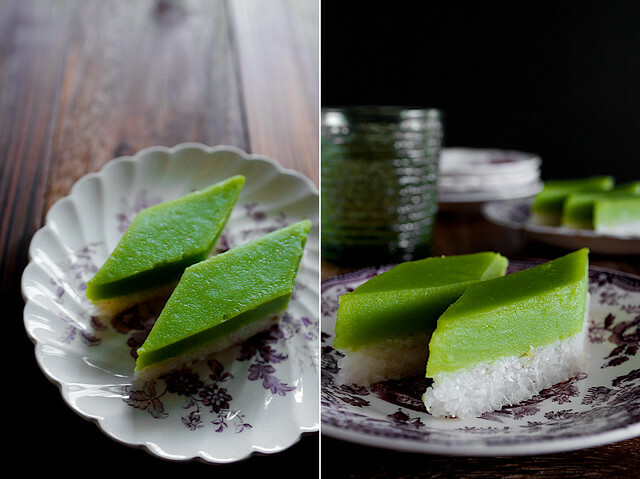 Note: Making the kuih using this method will not require additional green food coloring. 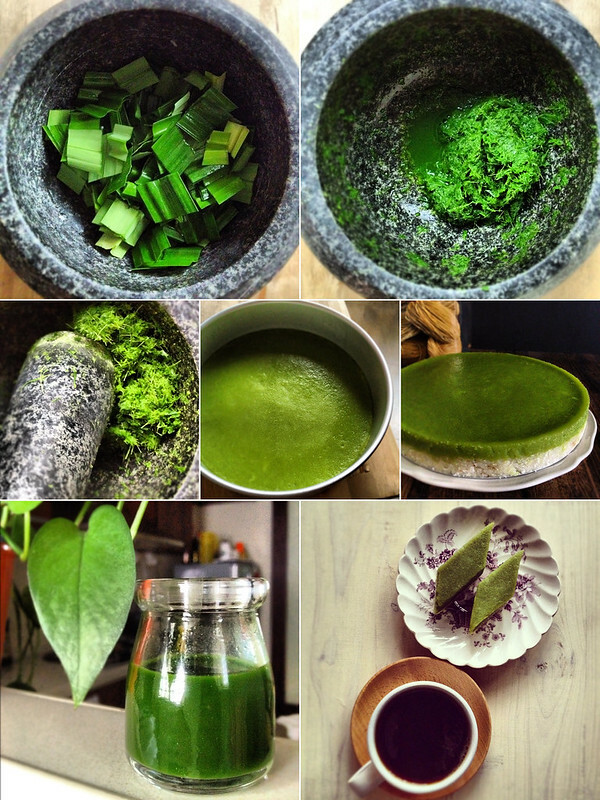 However, if you don't have access to pandan leaves where you are, substitute with pandan paste/essence and coloring. Results are best with fresh coconut milk and eggs as well. Or at least all the makciks in my life would tell me so. Prepare the pandan extract and syrup: With a mortar and pestle or a blender, mash the leaves finely along with the water into a paste. Use as little water as possible. Press through a fine sieve or squeeze through cheesecloth to extract the green juice only. You should obtain at least 100 ml liquid. If you have the time, let it sit for a few hours. The green extract will settle at the bottom and you can remove the excess water before using. For the sugar syrup in the custard layer, place the sugar, water and knotted pandan leaves in a saucepan and cook over medium low heat till sugar has dissolved. Remove and set aside to cool. Prepare the rice layer: In a rice cooker, over the stove or in a steamer, cook the glutinous rice till done with the coconut milk and salt. The amount of thin coconut milk used would depend on your cooking method. Meanwhile, bring the water in your steamer to the boil. Grease an 8-inch round or square baking tin (springform or removable base) with cooking oil and set aside. Mix the grated coconut with the cooked rice if using. Spoon the rice into the prepared tin. With a wet spatula or a piece of banana leaf, press the rice firmly onto the base of the tin to form an even and compact layer. Cover and steam, for about 15 minutes over medium heat. Once done, reduce heat to low but keep the tin inside the steamer. Prepare the custard layer: Mix the coconut milk with the prepared pandan extract. Bring the water of a double boiler/bain-marie to a boil. In the top bowl of the double boiler, combine flour, corn starch, eggs, coconut milk-pandan extract mixture and salt. Whisk till smooth. Then drizzle over the sugar syrup while whisking. Transfer bowl into the bain-marie and gently cook the custard over medium low indirect heat. Stir continuously till custard thickens slightly, about 15 minutes. Pour the custard over a sieve onto the rice layer. Cover and steam over medium low heat (keep this on the low side to obtain a smooth custard layer) for another 15-20 minutes or till custard is set. Remove tin from steamer and cool completely (about 1-2 hours) before cutting into diamond-shaped pieces. To get neatly cut pieces, use an oiled or heated knife. 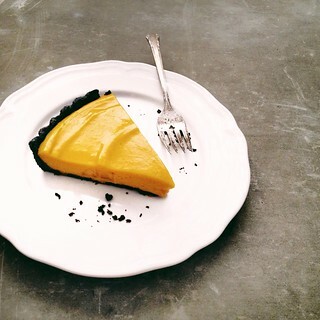 Serve with hot coffee or tea. Kuih keeps refrigerated up to 1 week. Bring chilled kuih to room temperature before serving. Hurray for the recipe!!! (three exclamation marks there!) I'm soo going to soak glutinous rice tonight. 5 ringgit? you're so lucky. 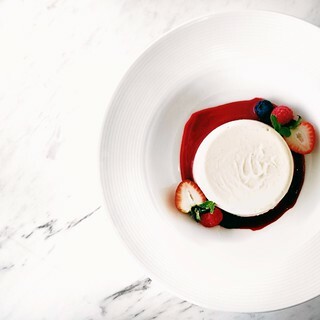 Oh, that is a dessert I adore! Your seri muka looks amazing. 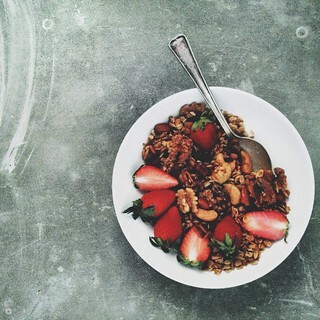 Perfect with a cup of green tea. I'll try to make it once my pandan plant gets bigger. Thanks for posting the recipe! Yeah, I remember the makcik that sells kuih in high school too. Her stuff is something else. Will give this recipe a try and see what happens to mine. Fingers crossed! Wow..the colors are captivating..never seen something like this before..would love to grab a piece! Your seri muka looks great! I missed kuih in Msia. I will give this a try when i have some time. Ribbon Clown: Hope it turned out well for you! RM5 is not a lot by the time I reached high school. Noodles are 1.50, kuih 1 ringgit for 3. I keep leftovers for usage during tuition classes. Rosa: Thank you! Tea or coffee would be perfect to go with this. Avis: Yes, it's best to use really old and big pandan leaves, they're much greener! Reese: The art of traditional kuih making is dying along with the makciks I tell you. I hope to learn a few more recipes before I die. 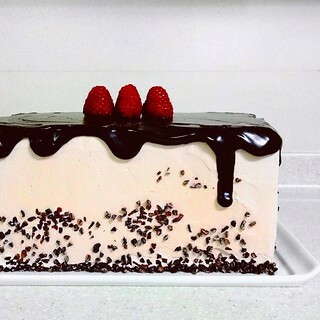 Sanjeeta: Thank you, make this! Lisa: By the time I was born, I don't think can even get 5 sweets for 20 cents. Haha! 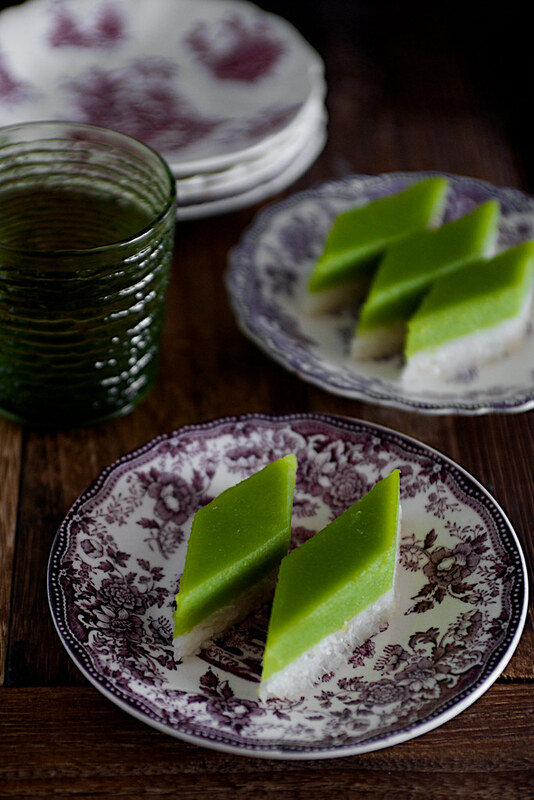 Chelsea: Traditionally this kuih has a soft custard layer. You can adjust the plain flour quantity next time to the firmness of your liking. This is an amazing recipe. I tried it using pandanus extract in a tin and green food colouring. It was just as how I remember it. Thank you so much. I have a question about using actual pandanus leaves leaves for the extract. Is it 100ml of the dark green extract (once the liquid has settled)? sabrina: Glad you liked the kuih. The 100 ml is including the water. hey there i tried this recipe yesterday and the custard layer was too soft... is it suppose to be like that? prathebba: Perhaps your steaming heat was too low. Either increase the heat or steam longer till the top layer is set nicely. Hello, i would like to feature this on my blog to illustrate natural food colouring. Thank you! Hi pick yin, I wanna thank you for posting the recipe from makcik Enon. I made this yesterday and it turned out great! 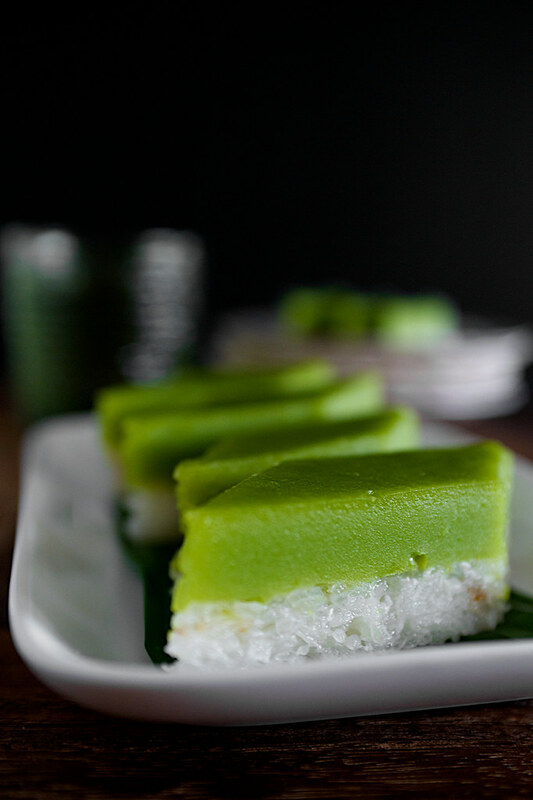 I'm at the uk and it's impossible to find this kuih where I live. Now, time to indulge in another 2 slices!! I love this cake so much since little. I 've made the cake by using your recipe but combine white sticky rice with black sticky rice and the result is amazing. My kids love it. Thanks so much! Hi! I just made my kuih Seri Muka using this recipe.. Its the best one i've made so far! The custard layer is yummy! And the custard to rice ratio is perfect... Thanx again for the awesome recipe! Syiera: Yay! Thank you for the feedback. I haven't been making this kuih for awhile now and after all these good responses, I guess it's time to make some again! Anon: The bubbles (if any) should be destroyed once you pass the custard through a sieve. Try again! For coconut milk, if we can't get fresh , can substitute with packet? Add how much water to make it thin? LeAnn: You can replace, how much water depends on what kind of packet you use. There are packet coconut milk, coconut cream, etc. Consistency should be similar to freshly squeezed coconut milk. I just wanted to say, I know that this article hasn't had any comments lately, but I just left Malaysia this mornibg after a wonderful 2 weeks. I first tried this exact treat on a breakfast buffet in Penang and was a fiend looking for it since. Luckily I was blessed with one more taste in KL lastnight at dinner. I am so happy to have come across this! I didn't know the green was panda flavour and I blew my mind because I make my own Pandan tea in Canada because I love Pandan so much! I currently live in China but will now be on the hunt for PanDan leaves so I can make my new favourite dessert!! Thank you for this recipe! !